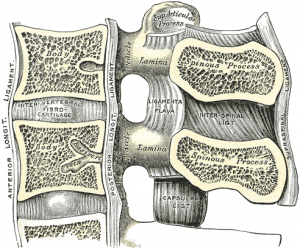 The ligamenta flavum is a short but thick ligament that connects the laminae of adjacent vertebrae from C2 to S1 and is considered a medial ward continuation of the fact joint . It consists of 80% elastin fibers and 20% collagen fibers.This high percentage of elastin fibers provides the ligament it's yellow color and flexible nature. At each intersegmental level the ligamentum flavum is a paired structure being represented symmetrically on both sides. The ligament flavum arises from the lower half of the anterior surface of the lamina above and attaches to the posterior surface and upper margin of the lamina below, forming a cup-like grasp on the upper border of the lamina below. The lateral portion : passes in front of the facet joint where it attaches to the anterior aspect of the inferior and superior articular processes and forms the anterior capsule. The most lateral fibers extend beyond the superior articular process to the pedicle below. The marked elasticity serves to preserve the upright posture and to assist the vertebral column in resuming it's shape after flexion. It resists excessive separation of the adjacent vertebral lamina and prevents buckling of the ligament into the spinal canal during extension, preventing canal compression. The lateral portion of the ligament prevents the anterior capsule of the facet joint being nipped within the joint cavity during movement. Ligamentum flavum can lose strength and elasticity, causing it to thicken and buckle towards the spinal column this is due to loss of elastic fibers which at same time increase in the thickness of collagen fibers ,These events cause deposition of Ca+2 in the ligament. Calcification of the ligament causes hypertrophy and can lead to spinal canal stenosis (narrowing of the spinal canal) which can sometimes cause pain. Hypertrophy of this ligament may cause spinal stenosis because it lies in the posterior portion of the vertebral canal. Increased expression of TIMP-2 in ligamentum flavum fibroblasts is associated with fibrosis and hypertrophy of the ligamentum flavum in patients with spinal stenosis. Many causes of neck and back pain are directly related to the ligamentum flavum. Though the anatomy of the spine is quite complex, treating conditions that affect it does not have to be. Unfortunately, there is little to no regeneration power of elastin tissue at ligamentum flavum, loss of elastin tissue cannot be recovered. The combination of MRI and computed tomography seems the most useful for the precise diagnosis of OLF. ↑ Nikolai Bogduk. Clinical and Radiological Anatomy of the Lumbar Spine 5th Edition.Churchill Livingstone: Elsevier. Feb 2012. ↑ Park J B, Lee J K, Park SJ, Riew KD .Hypertrophy of ligamentum flavum in lumbar spinal stenosis associated with increased proteinase inhibitor concentration.The Journal of Bone and Joint Surgery-American . 2005 Dec:87(12):2750-7. ↑ J. Hanakita ,H. Suwa , F. Ohta , S. Nishi , H. Sakaida . Neuroradiological examination of thoracic radiculo-myelopathy due to ossification of the ligamentum flavum .Neuroradiology Jan 1990 :32 (1):38-42.